EghtesadOnline: During to the first two months of the current Iranian year ending on May 21, with 226,584 cars and duty vehicles rolling out of factories, the key automotive sector recorded a 31.1% year-on-year growth. According to data released by the Ministry of Industries, during the two months, Iranian companies made 214,325 cars, up 31.5% compared to the same period of the last year. Production of pickup trucks and trucks respectively observed 24.6% and 22.7% YoY hikes reaching 9,613 and 2,107. Production of buses declined 15.2% compared to the same period of last year falling to 151 units. Iranian makers have also pushed ahead with plans to boost van and minibus output rates with 152 and 236 units produced in each respective class— up 58.3% and 84.4% year-on-year, Financial Tribune reported. The country has six carmakers which during the past few years have forged strong ties with foreign firms directly or through their subsidiaries and collectively manufacture 41 models. In terms of total output during the two-month period, once again Iran Khodro has been able to reclaim its title as the country’s largest automaker, with 97,935 units rolling out of its plants. The company has recorded a 12.9% hike in its production rate. IKCO is closely followed by its archrival SAIPA, churning out 96,326 units. The company has recorded an astounding growth rate of 66.9% during the period. For the previous three consecutive months, SAIPA had been able to outstrip IKCO as the largest carmaker in Iran in terms of total output. According to the latest figures, IKCO has reclaimed its adamantly preserved the title. 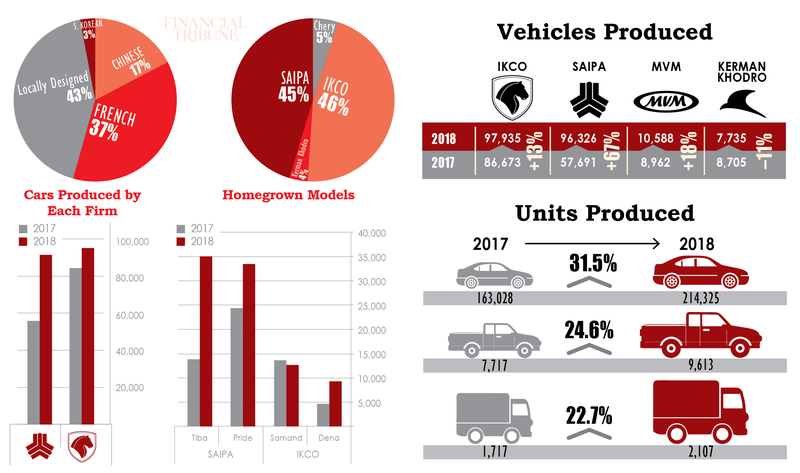 It merits mention that considering the rapid growth rate of SAIPA, IKCO may lose the title in coming months once more. Both IKCO and SAIPA are semi-state-owned and their managers are appointed by the government. Among privately owned firms, Chinese carmaker Chery’s operations in Iran is leading the way. During the two-month period, Chery produced 10,588 cars in Iran, recording an 18.1% surge in its total output. The second largest private automotive firm in Iran, Kerman Khodro’s production rate has plummeted 11.1% falling to 7,735 units. The company has fostered ties with South Korea’s Hyundai Motor. However, since US President Donald Trump withdrew the country out of Iran’s nuclear accord in early may, the collaborations between Kerman Khodro and Hyundai have hit a bumpy road. Iranian firms have forged ties with 14 Chinese carmakers, namely Brilliance, BYD, Changan, Chery, Dongfeng, FAW, Geely, Haima, Haval, Hawtai, JAC, Lifan, MG SAIC and Zotye. Cars produced through collaborations with these firms have a 17% share in Iranian carmakers’ total output. The share has not changed compared to the same period of the last year. During the two-month period, 36,882 cars were produced through the Sino-Iranian collaborations, indicating a 32% surge compared to the same period of the last year. Major Iranian carmaker SAIPA has developed ties with Chinese firms Brilliance, Changan and Zotye. It has made 12,321 cars in collaboration with its Chinese peers. The production rate has observed a 65.4% YoY jump. Furthermore, SAIPA has revealed plans for expanding ties with the three to further grease the wheels for the company’s ascent to the top as the country’s biggest carmaker. In April, Managing Director of SAIPA Mohsen Jahroudi traveled to China and visited Brilliance, Zotye and Changan’s factories and discussed fostering new collaborations with his counterparts. SAIPA’s archrival, IKCO has also expanded its relations with Chinese automakers Dongfeng and FAW’s Haima brand. The firm churned out 7,598 cars carrying the badge of Dongfeng and Haima indicating an 88.9% YoY increase. Chery has a direct presence in Iran. The firm currently produces six models in Iran which come with two different badges, namely the Chinese carmaker’s own logo and a brand registered in Iran named Modiran Vehicle Manufacturing carrying the logotype of MVM. Kerman Khodro has observed a decline in its collaborations with Chinese carmakers with 5,397 units produced— down 26.1% on the year. The firm through its various subsidiaries has forged ties with five Chinese carmakers namely, BYD, Geely, Hawtai, JAC and Lifan. The firm’s collaborations with Hawtai kicked in earlier in March and test production of Hawtai A25 was launched in Iran. The first units of Hawtai A25 rolled out of Rigan Khodro’s factory during the current fiscal. Rigan Khodro is a subsidiary of Kerman Khodro based in Arg-e Jadid Special Economic Zone in the southeastern province of Kerman. The firm has produced 162 units of Hawtai A25 during the two-month period. One of the other emerging automotive companies in Iran cultivating a Sino-Iranian auto joint venture is Bahman Group. The company produced 868 units, significantly higher than its last year’s meager 139 unit output during the same period. Bahman works with FAW and Great Wall’s subsidiary Haval. In addition to Chinese firms, Iranian carmakers also work with French automotive companies, namely Renault and PSA Group’s Peugeot and Citroen brands. During the two-month period, 78,846 French-derived cars were made in Iran showing a 9.9% YoY hike. French-derived cars have a 37% share in Iranian carmakers total output, down seven points compared to the same period of the last year. Following Trump’s underhand move, PSA Group suspended its operations in Iran for the time being. However, Renault has announced that the company is to maintain its activities in Iran even if it is forced to limit its business in the country. Renault signed a €660-million trilateral production deal with Industrial Development and Renovation Organization of Iran and the local private company Negin Khodro last August. PSA Group’s Peugeot and Citroen brands respectively have signed deals with IKCO and SAIPA. IKCO has the biggest share in the subsector, producing three Peugeot models, namely 206, 405 and 2008 along with Renault’s Logan. While the suspension of its collaborations with Peugeot may hinder the production of the 2008, the company is capable of manufacturing the 206 and 405 almost independently. It has been manufacturing the two models for over two decades. IKCO manufactured 64,579 cars bearing the badge of Peugeot (up 10.5% YoY) and 2,806 Renault Logans (down 36.4% YoY). SAIPA produces two Renault models, Sandero and Logan, which is locally better known as Tondar 90 or L90. The company made 11,461 units of the two models during the two month period boasting a 29.3% hike. Currently, Iranian carmakers have four models on their production lines which have been designed from scratch in the country, namely Dena, Runna, Samand and Tiba. The first three are designed by IKCO and the last by SAIPA. Furthermore, SAIPA manufactures a small city car based on KIA’s Pride since 1993. The model has nothing in common with the original KIA model but its outer shell; therefore, in this report SAIPA’s Pride although not initially designed by the company will be categorized as “homegrown”. The aforementioned vehicles have a 42% share in Iranian carmakers’ total output, seven points higher compared to the same period of last year. 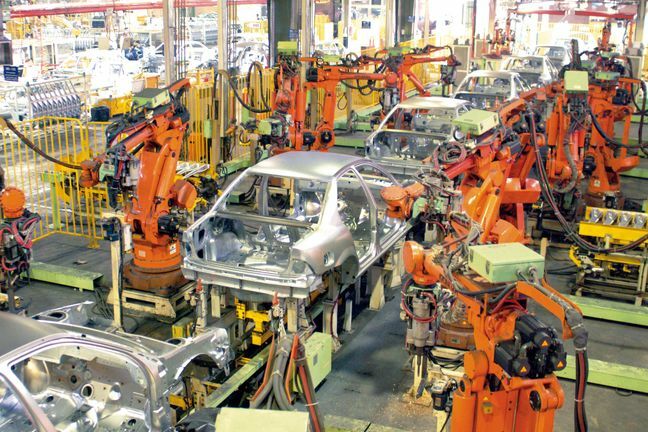 The models’ production rate has observed a noteworthy 59.7% hike with 90,908 units rolling out of IKCO and SAIPA factories. The biggest share in the subsector is claimed by SAIPA’s Tiba with 35,091 units (39%) followed by Pride with 33,496 units and 37%. Production of Pride has observed a 37.3% surge. SAIPA has also boosted production of Tiba, churning out 35,091 units of the model, recording an outstanding 153.5% YoY spike. IKCO’s Samand with 12,632 units claims the title of the third most manufactured homegrown vehicle in Iran with 14% followed by Dena with 9,323 units or 10%. The firm has doubled production of Dena (100.9% increase) while production of Samand has slightly declined (down 7.2%).